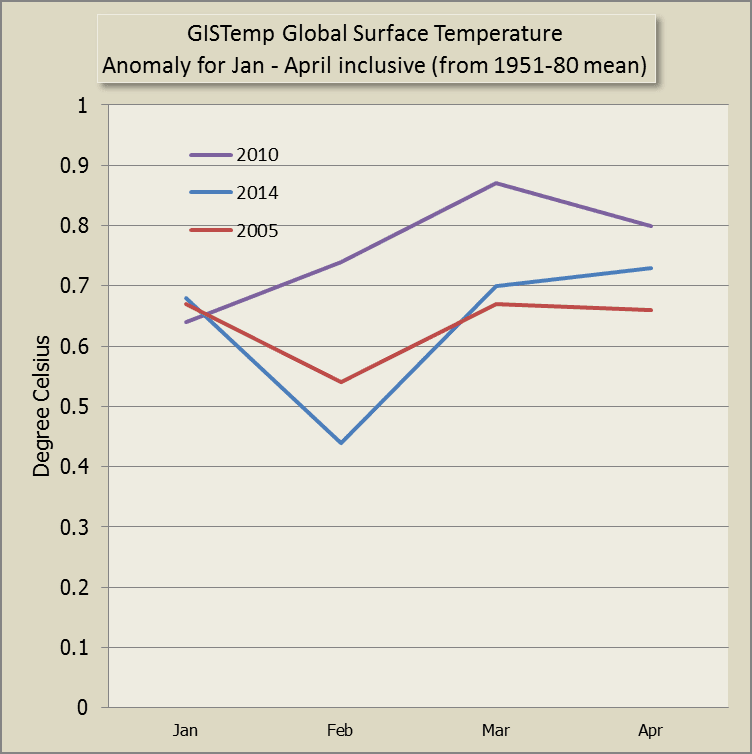 "January 21, 2014: The GISS analysis was repeated this morning based on today's status of the GHCN data. The changes were well within the margin of error, e.g. the L-OTI mean for 2013 changed from 0.6048+-0.02°C to 0.6065+-0.02°C, a change of less than 0.002°C. However, rounding to 2 digits for the L-OTI table changed the 0.60°C used in some documents prepared last week to 0.61°C. This minuscule change also moved year 2013 from a tie for the 7th place to a tie for the 6th place in the GISS ranking of warmest years, demonstrating how non-robust these rankings are." Thanks Nick. The recent changes are post January as far as I can make out and data going way back to the start of the records has changed a bit (see above chart). So from what you're saying, the GHCN homogenization has probably changed in the last month or so, but there's no word yet that I can see. Nothing since the February comment. 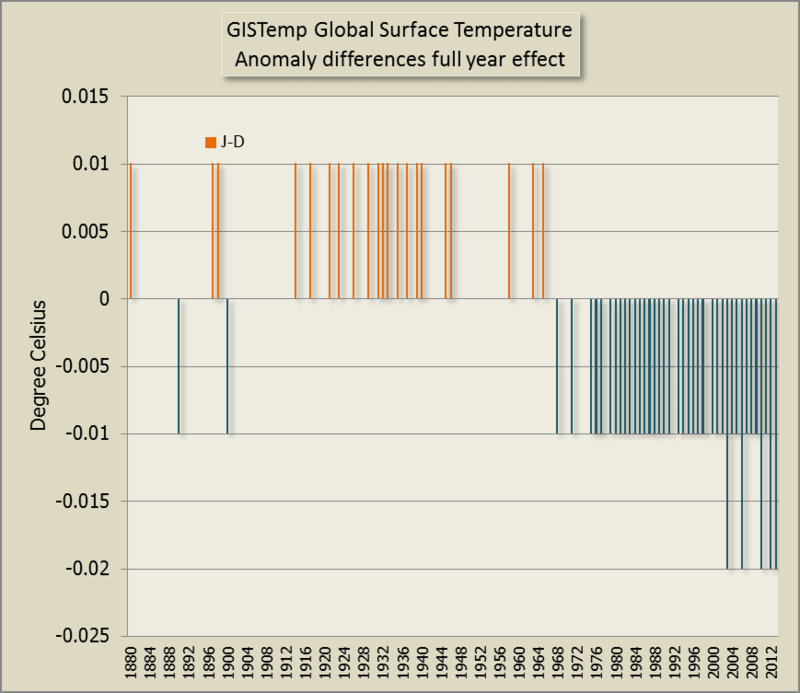 Just to clarify, the 2013 GISTemp temp is now showing 0.59 not 0.61 (or 0.60) - for Jan-Dec, so there have been further adjustments since that note from January. I think the main reason for change with 2013 is late data, and also flaky data that gets fixed. There has been a lot of flakiness lately. Here is a study of how data trickled in with v2. I think what happens with flaky data is that it gets reasonably treated by homogenisation, but if the original error gets fixed, then that's another change. However, I haven't seen a lot of fixing in GHCN lately. Thanks, Nick. Yes 2013 data adjustments make sense and happens fairly often. It's the fact that there were changes going back to year one (1880) that made me wonder if a new algorithm was being used. I've not seen so many records changed before (818 changes from 1880 through to 2013). Makes it a bit easier to set a new "all time high" when you wash away some of the heat from the previous all time high. Premature denial - definitely signs of nerves. You obviously missed the graph above where it is clearly shown that the adjustments of recent years have mostly been downwards? Not very "sceptical" are you? The poor man is clearly rattled by the chance that a new all time high might be set. After all, this shouldn't be possible if you believed all that crap about the planet cooling since 1998. Still, I am sure that our unsceptical friends will be issued with a new set of nonsense to parrot very shortly: "no warming since 2015, squawk, squawk". Do you actually believe that what you posted has any validity? Or are you just having a laugh and trying to wind people up? I am just interested. If you do believe it is valid please give us a description of your calculations to support it. phil hansen is clearly doing cooling adjustments to confuse us. He probably heard us point out that his adjustments are always up so he thought he'd quickly throw in some minor cooling adjustments.